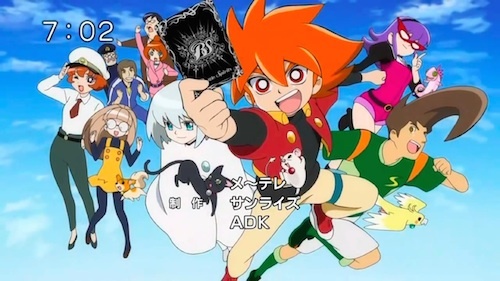 In my previous review of the card game anime Battle Spirits: Shounen Toppa Bashin, I stated that the series is the best show of the collect-em-all TCG competition genre that I’ve ever seen. Having finished the series, I stand by that opinion more than ever. Though the climax and resolution of the series is a bit too abrupt, the overall sense of consideration for what it’s trying to convey and the continued growth and progress of its characters on both emotional and “competitive” levels make Shounen Toppa Bashin remarkably deep and a joy to watch. In the transition to the latter half of the 50-episode Shounen Toppa Bashin, the series moves its characters from elementary school to middle school. This brings with it a whole host of changes, such as the shift to school uniforms. However, what is fundamentally different about the anime from this point forward is that the characters are beginning to be viewed as young adults, even if their designs don’t change that much. The best example of this would have to be Episode 32. In a seemingly generic boys’ show about playing other people in card games, Shounen Toppa Bashin devotes 25 minutes to exploring the mother of the main character and her feelings of loneliness as she watches her son hit that age where boys begin to emotionally move away from their parents while also dealing with the fact that her husband is never home (he’s out adventuring). As the protagonist Bashin Toppa nonchalantly ignores his mother Hayami (a case of being oblivious in general but also taking her for granted), her sudden disappearance makes him realize that all of the little moments in which she was “bothering” him were actually cries for help and attention. Upon remembering that it’s his responsibility to look after her in his father’s absence, Toppa ends the episode by declaring that card games aren’t as important as their relationship as family. The obvious joke with TCG shows (thanks in part to Yu-Gi-Oh: The Abridged Series) is that whenever there’s a deep emotional connection, it’s usually in the sense of friendship, that one’s companions give the moral support one needs to overcome any adversary. Though that also exists in Shounen Toppa Bashin to a strong extent (and is better developed compared to other series as well), the situation between Toppa and Hayami is actually a moment where the show says that its own card game is meaningless if it means neglecting those close to you who are in need. The complex emotions of a mother watching her son grow up take center stage in a genre that is more often known for actively ignoring parents entirely. However, Shounen Toppa Bashin not only expresses this sense of change outside of the card game its purported to sell but within it as well. From the beginning of the series, each character is associated with a certain color-themed deck. For example, Toppa runs a “red” deck, which is primarily devoted to outright aggression, while his main rival Sawaragi J utilizes a “white” deck, which emphasizes healing, defense, and regeneration. Conveniently, both characters are color-coded in their designs as well. Early on in the second half of the anime, Toppa finds that while he’s continuously improved as a player, his red deck has reached its limits. When another character suggests that he incorporate other colors, Toppa’s initial response is that the red attribute is a part of his identity, implying that he thinks using other colors means abandoning his very way of being. Eventually, he realizes the benefits of mixing it up and being able to grow beyond the one-dimensionality of his old methods while still maintaining it as a mostly red-oriented deck. It’s at once both an easy example for kids to learn how to improve their strategy in this game and a way of showing Toppa’s increasing maturity. Similarly, when J goes from friendly rival to antagonistic force in the series, he abandons the white deck that had previously characterized him in order to go for something more varied and ruthlessly efficient. At the finals of a tournament, Toppa confronts J, and at the climax of a fierce, back-and-forth match between the two, Toppa plays a card that can win, provided the opponent has no white cards with which to defend. 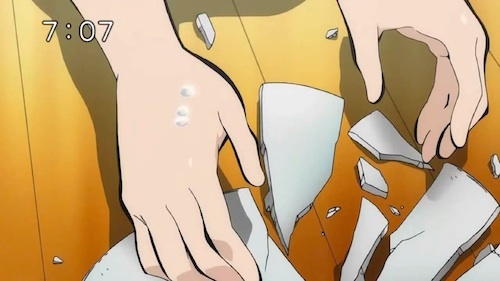 This is seen as suicide by all of the characters given J’s propensity for that color, but then the show reveals that J’s hand is devoid of any white cards. In other words, in his desire to find the “best” way to win, J forgot who he was. Combined with the lesson Toppa learns earlier in the series about varying his own deck, the result is a greater message of being open to change but not to the extent that you forget who you are and what values are important to you. And all of this is through the card game itself! The last example of personal and emotional progression I’d like to talk about has to do with something I mentioned in the previous review, which is the development of a character from sideline cheerleader to direct participant. This is the path taken by the character nicknamed “Meganeko” due to her over-sized glasses. While you have examples of both in TCG anime, such as Anzu/Tea in Yu-Gi-Oh! Duel Monsters and Asuka/Alexis in Yu-Gi-Oh! GX, rarely does one turn into the other, and as in strong a fashion as Meganeko. At the beginning of the series, Meganeko is essentially Toppa’s close childhood friend, unwavering supporter, and tacit love interest. Around the half-way point of the series on their last day of elementary school, Toppa and Meganeko have a fight because Toppa just wants to go play more “Battle Spirits,” whereas interprets his behavior to mean that all of their cherished memories of elementary school and their friendship mean nothing to him. 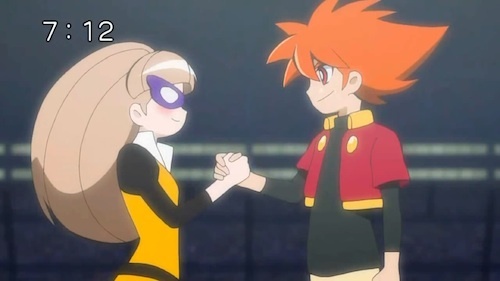 Rather than merely waiting for Toppa to realize his mistake, however, Meganeko decides to learn how to play “Battle Spirits” in secret in order to understand him better and to basically meet him half-way, thus showing her active desire to better herself. 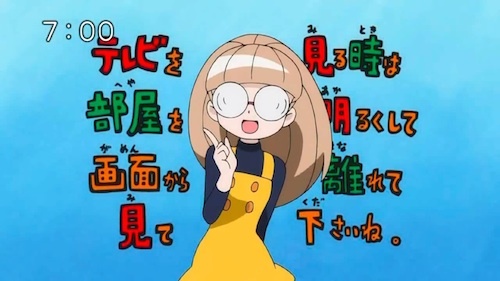 The typical series would have Meganeko learn the basic rules of the game and place value on simply the fact that she tried at all while at the same time placing her on a skill tier below the “important” characters. Shounen Toppa Bashin, instead, actually defies this trend by transforming Meganeko into a formidable competitor as well. Through her training, Meganeko becomes about as proficient in “Battle Spirits” as Toppa in a lesser amount of time. Not only does she find her own identity within the card game (a yellow “spell and support” deck), but she also ends up overcoming an opponent who had previously bested J, and even meets Toppa himself in the semi-finals of a tournament. Though Meganeko loses in the end, the show presents their battle and Toppa’s reactions in such a way that it’s clear that she has firmly established herself as Toppa’s peer in the very field he so cherishes through her hard work. By the end of the series, neither wins nor losses are guaranteed for Meganeko (or any of the other characters for that matter), which further highlights her position as being equal to that of Toppa, J, and the rest of the core cast. Overall, Battle Spirits: Shounen Toppa Bashin is able to provide characterization and emotional development at various levels, both in direct relation to the card game after which the series is named and with respect to the realistic concerns that might face children as they grow up. The former can be seen in how Toppa and J are symbolized and represented through their personal decks and strategies, while the latter is most evident in the amount of care and attention the series gives to the relationship between Toppa and his mother. Furthermore, the character Meganeko presents a mix of these two aspects while also showing how a “cheerleader” female character can transform into a direct participant in an anime, thus providing a potential template for other characters as well. The cumulative effect of these and many other aspects of Shounen Toppa Bashin result in a series that is worth emulating. This entry was posted in anime, review and tagged bashin hayami, battle spirits, shounen toppa bashin, tcg, trading card games. Bookmark the permalink.